1.715" (43.55mm) OD x 1.160" (29.46mm) ID x 0.215" (5.46mm) thick, tolerance +/- 0.004" (0.10mm), PTFE Coated, N42 Rare Earth Neodymium Ring Magnet, Magnetized through the thickness. 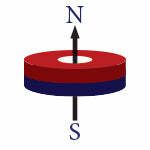 About Large Ring Magnets: Defined with an outside diameter (OD) equal to or greater than 1.000” (25.40mm). The outer diameter (OD), inner diameter (ID), and thickness will determine the reach and profile of the magnetic field and performance of the ring magnets. Main Industries: Predominantly medical and food industries.